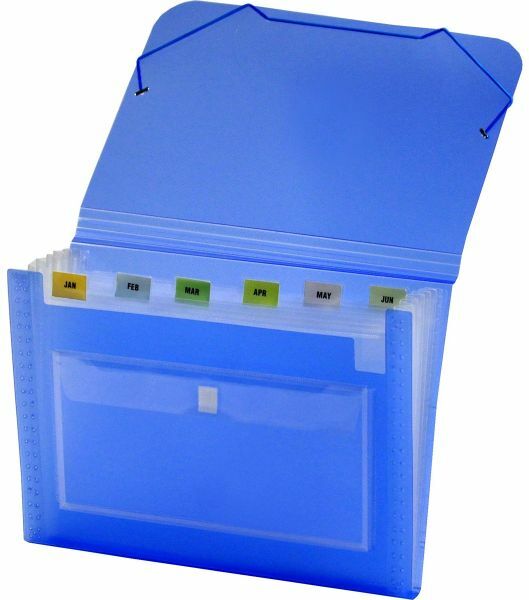 LION CLEAR-LINE 7 pocket expanding file in transparent blue, with 6 index tabs. Portable plastic expanding file has 7 roomy letter size pockets with A-Z, monthly blank tabs included. Each expanding file pocket is gusseted and is perfect for sorting materials. Convenient pocket on front panel with hook and loop closure to store loose items. Protective full flap with elastic closure keeps contents secure. Striped pattern Poly material keeps from scratching. This high transparency blue wallet file is ideal to organize tax documents, monthly bills or statements. School assignments are also neatly organized in this stylish expanding file organizer. Made from recyclable polypropylene.